"These were made for me when I was a youngster, I'm now 55 years young. My Grand and Great Grand children love these. Enjoy!" Preheat a large skillet to a high heat. With a small biscuit cutter remove centers from bread. Butter slices on one side only. Grill bread until lightly toasted. Crack an egg into each bread hole (be careful not to break the yolk). Season with salt and pepper to taste. 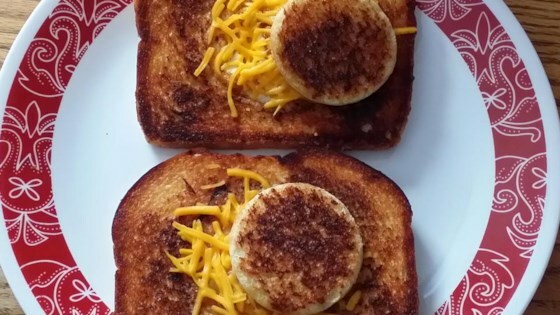 Lay 1 slice of cheese on each egg and then the bread rounds. Cook until eggs are cooked to your desired consistency. I've been making these for years, use cookie cutters of various shapes for fun with the kids!! Delicious! I cut this down to one serving for breakfast and waited until the egg was cooked before adding the cheese. Great with a side of Canadian bacon and OJ!